Image: Agtechnologies including CropX and mOasis present opportunities for irrigators to grow more produce with less water. 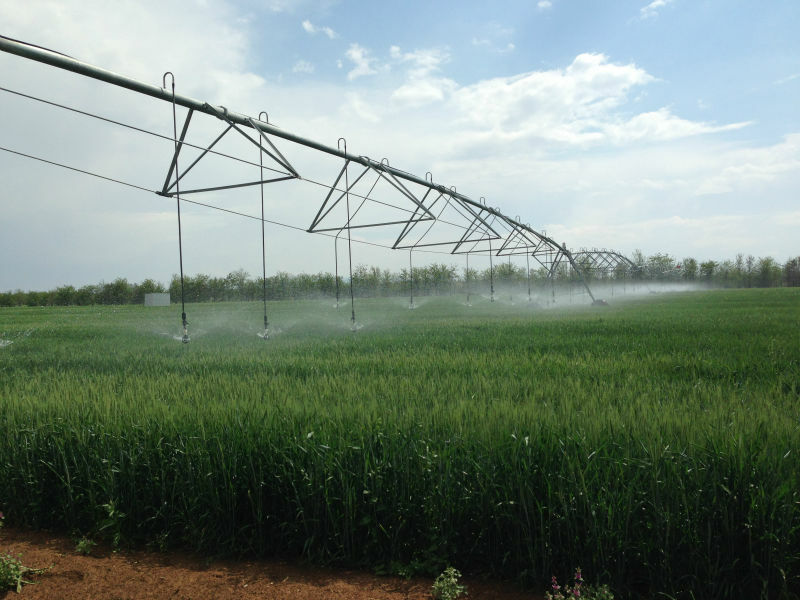 Turkey Centre Pivot Irrigation System from Alibaba, labelled for reuse. The impact of climate change combined with an increasing global population and a reduction in arable lands is pressuring technology for a solution – how to grow more food with fewer resources. Generating excitement within the tech world, the race to find the best agtech solution is also gathering interest from investors with large sums of money being offered up by venture capitalists. While Australia hasn’t yet realised its full potential in the agtech world, America and Israel are successfully leading the way in the development of agricultural technologies. In this article, we take a look at three of the most exciting emerging products from agtech start-ups. CropX – an Israeli developed system – aims to help irrigators to boost crop yields and save on water with a network of in-field sensors. The CropX system is capable of scanning a paddock and determining distinct production zones and even identifies the best location for sensors to be installed within a paddock. Once installed, the system automatically develops an irrigation plan and sends the farmer daily text messages providing an overview of soil moisture levels and suggested requirements on a per zone basis – meaning water applications can be more informed and precise processes. At US$600 per sensor, installing multiple units into a paddock is not only feasible but also significantly cheaper than many other soil moisture probe brands. The farmer can install each sensor in minutes, reducing the need and expense of hiring a contractor. Another start up that promises to improve the efficiency of water use for irrigators is mOasis. This American company has developed and manufactured several soil additives that help retain water in the soil, meaning fewer irrigation applications and healthier crops. mOasis products come in various formats including powders and granules, which are applied to paddocks with common farm machines such as a seeder or spray unit. The company claims that BountiGel P retains up to 250 times its weight in water helping to provide consistent moisture to plants, reducing stress and increasing yields and quality. Initial trials have shown promising data for mOasis products. A study undertaken by the University of Fresno in California investigated the impact of BountiGel on irrigated tomatoes over three years. The trial resulted in a yield increase of 8.5% and return increase of $370 / acre, plus additional savings through reduced water use, compared to crops grown without the additive. The company’s core focus is the development of Field Pennycress into a viable cash crop to be used as both a renewable fuel and animal feed source. As a winter crop, Arvegenix is promoting Pennycress as an alternative to fallowed paddocks between soy and corn rotations, providing farmers with additional revenue and a source of valuable cover to reduce erosion and nutrient losses. A member of the brassica (mustard) family, Pennycress seeds are very high in oil with the right properties to be used in biodiesel and aviation fuel. Initial research suggests that pennycress biodiesel is much more suitable for use in cold climates than other oil-based biodiesel products. A by-product of the extraction of oil is Pennycress meal, which is being tested for its suitability as a source of nutrition for ruminant animals. Arvegenix claims that Pennycress meal could contain 33-35% protein, fatty acids and carbohydrates ‘that are expected to provide an excellent feed for ruminant animals’. Arvegenix was set up by a team of ex-Monsanto Executives and has received funding through Monsanto’s venture capital arm – Monsanto Growth Ventures (MGV).